Republican Kevin Stitt has defeated Democrat Drew Edmondson and Libertarian Chris Powell to become Oklahoma’s next governor. The Tulsa businessman is a political newcomer who largely campaigned on his business background. With Stitt’s win, Republicans have won six of the last 11 gubernatorial elections in Oklahoma. Stitt will now have the ability to influence Oklahoma’s 2020 legislative redistricting process. If the legislature can’t come up with a plan, the governor appoints a panel to draw the district lines. His win comes as outgoing Governor Mary Fallin, also a Republican, has the lowest approval rating of any governor in the country at just 17 percent, according to Morning Consult. 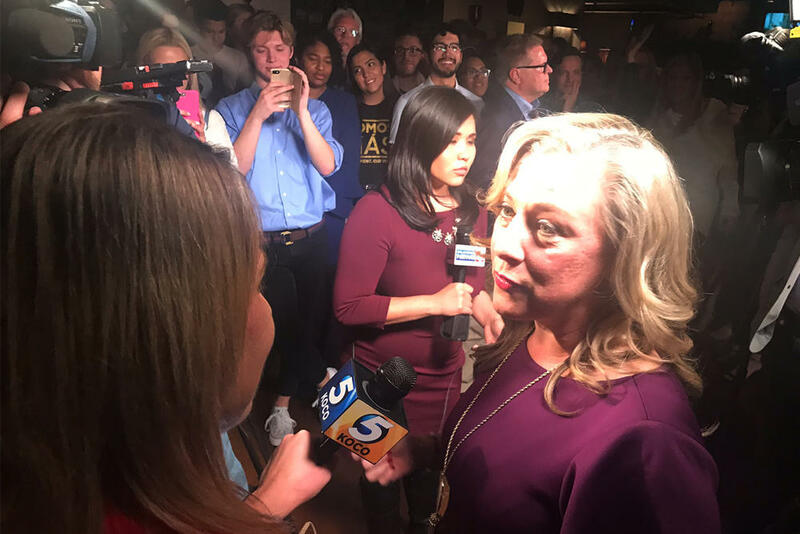 Oklahoma will send a new Congressman and Congresswoman to Washington, D.C.
Democrat Kendra Horn defeated incumbent Republican Steve Russell by nearly 3,300 votes. Horn is only the third woman to serve Oklahoma in the U.S. Congress—Republican Alice Robertson served from 1921 to 1923 and current Governor Mary Fallin served from 2007 to 2009. Horn is also the first Democrat to serve Oklahoma in Congress since Dan Boren retired in 2013. Republican Kevin Hern will join Horn as a freshman member of Congress. He was elected to U.S. Congress in House District 1, defeating Democrat Tim Gilpin. Hern replaces Jim Bridenstine, who vacated the position when he was appointed by President Trump to lead NASA. U.S. 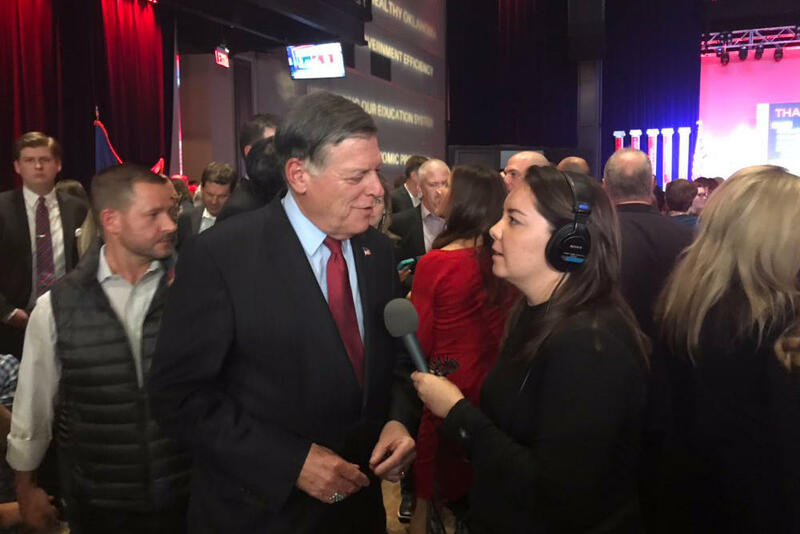 Congressman Tom Cole speaks with StateImpact reporter Jackie Fortier at an Oklahoma City watch party. Three other Republican Congressmen from Oklahoma were re-elected to U.S. Congress. Republican Markwayne Mullin has been re-elected to U.S. Congress in House District 2, defeating three challengers. Mullin has held the seat since 2013 and has drawn criticism for running after breaking his promise to only run for three terms in Congress. Republican Frank Lucas has been re-elected to U.S. Congress in House District 3, defeating Democrat Frankie Robbins. Lucas was first elected to Congress in 1994 and is the longest serving member of the Oklahoma Congressional delegation. Republican Tom Cole has been re-elected to U.S. Congress in House District 4, defeating Democrat Mary Brannon and Independent Rudy Peters. Cole was first elected to the House of Representatives in 2002. State Question 794 — also known as Marsy’s Law — was the lone state question to be approved by Oklahoma voters. SQ794 will give crime victims new rights that could help them better navigate the criminal justice system. Marsy’s Law has passed in six states and similar ballot measures were being considered in other states. Marsy’s Law has been ruled unconstitutional by the Montana Supreme Court. State Question 793 would have changed the state constitution to allow Oklahoma optometrists to open clinics in large retail stores like Walmart and Target. State Question 798 would have changed the state constitution to make candidates for Governor and Lieutenant Governor run together on the same ticket as running mates. Currently, the Governor and Lieutenant Governor run separately. State Question 800 — also known as the Oklahoma Vision Fund — would have established an additional fund that would take in 5 percent of Oklahoma’s oil and gas production tax revenue. That money would be invested by the state in low-risk stocks and securities. State Question 801 would have allowed school leaders to spend money in their building fund — currently restricted for things like construction projects, maintenance and repairs and utilities — in new ways. Republican Matt Pinnell has been elected as the state’s next Lieutenant Governor. The former state Republican chairman defeated Democratic state Senator Anastasia Pittman and Independent Ivan Holmes. Pinnell will replace outgoing Lt. Gov Todd Lamb. Incumbent Republican Mike Hunter has been re-elected as the state’s Attorney General over Democrat Mark Myles. Hunter was appointed by Governor Mary Fallin in 2017 after Scott Pruitt was appointed by President Trump to lead the Environmental Protection Agency. Incumbent Republican Joy Hofmeister has been re-elected as the state superindent of public instruction, defeating Democrat John Cox and Independent Larry Huff. Republican Cindy Byrd defeated Libertarian John Yeutter to become state auditor and inspector. Republican state representative Randy McDaniel will be the new state treasurer, defeating Independent Charles de Coune. Republican state representative Leslie Osborn will be the new labor commissioner, defeating Democrat Fred Dorrell and Independent Brandt Dismukes. Republican state representative Glenn Mulready will be the new insurance commisioner, defeating Democrat Kimberly Hobbs. Republican Bob Anthony was also re-elected to the Oklahoma Corporation Commission over Democrat Ashley Nicole McCray and Independent Jackie Short. Anthony has held the position since 1989. One of the big themes we’ve seen across campaigns this year is education. It’s a theme that started back in 2016 when we saw two dozen teacher candidates file. Most of them lost then. After this spring’s teacher walkout, the number of education candidates ballooned. Nearly a third of those candidates won their election today. A total of 39 educators ran for office in the Oklahoma House of Representatives, but just 13 won. Nine of the winners are Republicans and four are Democrats. We’ll have more election news and analysis on Wednesday’s Morning Edition. Polls have closed in Oklahoma. The Oklahoma State Election Board publishes an unofficial result tally, as they come in, from county election boards. You can see them here. KOSU, KGOU, KCCU, StateImpact Oklahoma and NPR are covering local and national election returns over the next few hours. We have public radio reporters stationed across the state to bring your the most up-to-date coverage. Tune into our stations on-air or online, or stay tuned to this post. We’ll provide context and analysis as the results roll in. Public radio reporters continue to canvas the state today as Oklahomans vote in the 2018 Midterms. An election inspector told us there were a dozen people lined up to vote when polls opened at the University Village retirement community in Tulsa, which he says is unusual for a midterm election. Jessi Bergschneider was on her lunch break from the local tag office. She says teachers need to have the tools to teach future generations. But don’t assume she’s voting for a particular party. Misty Jarrett works for Quantum Aviation at the Tulsa International Airport. Her father is in hospice care at the retirement community. Her top issue is health care, followed closely by Donald Trump. But Jarrett forgot to update her ID after her recent divorce, so she was turned away from this polling location. 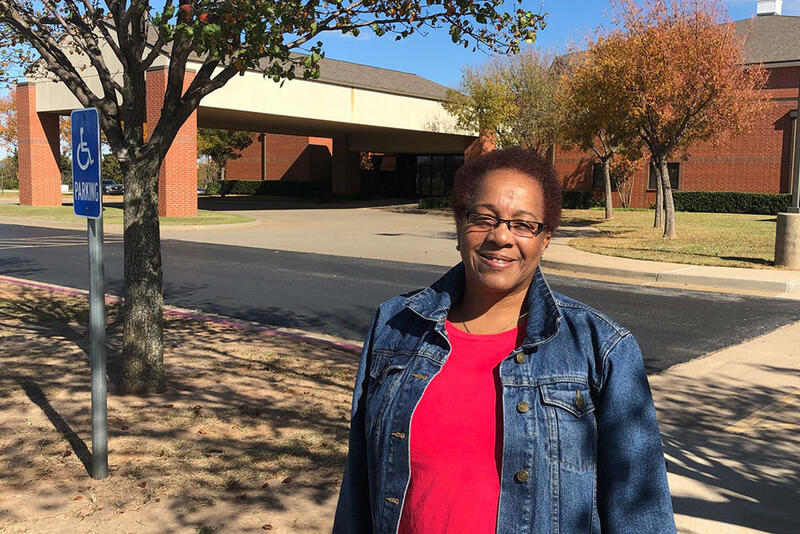 Outside a polling location at the Windwood Free Will Baptist Church in south Oklahoma City, Tom Cole supporter and University of Oklahoma professor Doris Benbrook says she is most concerned about the state’s economy — but struggles with giving tax breaks to oil and gas companies. Harry Pelphrey is a retired air traffic controller. His big reason for voting today? Democratic gubernatorial candidate Drew Edmondson. “He’s strongly in favor of supporting education and is also strongly in favor or reinstituting a seven percent oil tax and I think both of those are good ideas,” Pelphrey said. Pelphrey came prepared and brought along a cheat sheet for the five state questions on Oklahoma’s ballot. 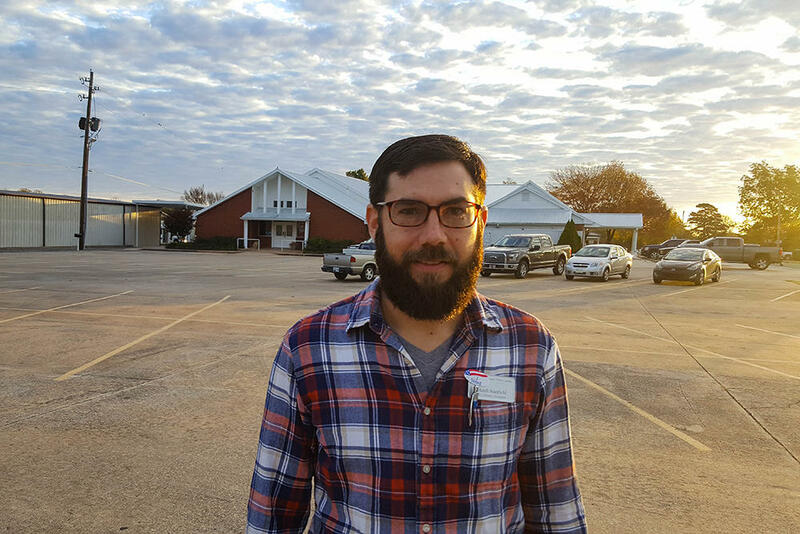 At the Church of Christ in Yukon, Dana Hall took the day off to vote. The substitute teacher is voting for Republican Kevin Stitt for Governor. Hall says she will stay up tonight to watch election results. Meanwhile, voter Arnita Colbert, who is working to get a certification in IT Professional Support, says education and tax burdens on lower income families are some of the reasons she is voting today. She supports Democrat Drew Edmondson for Governor. “I believe Drew Edmondson is an individual that will stand for the people and all the people, Oklahoma, and will make those decisions,” Colbert said. Colbert says she didn’t have to wait very long to vote during the early afternoon either. 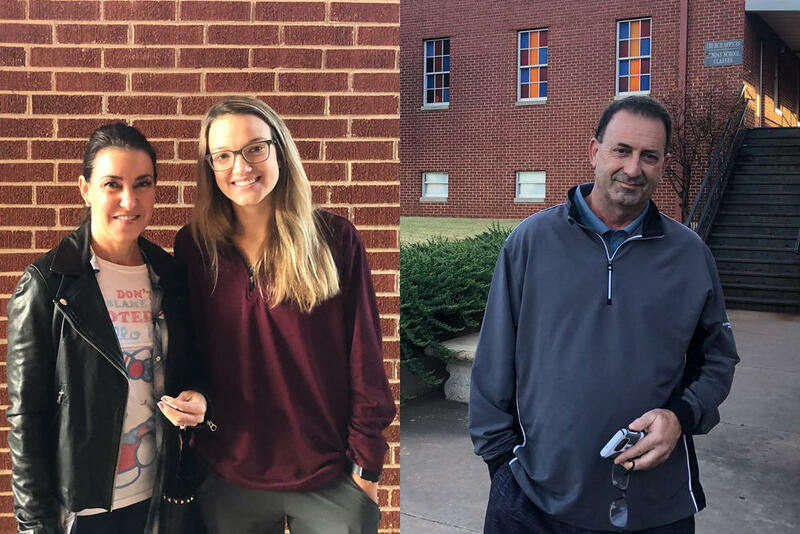 Oklahomans are heading to the polls today, and Oklahoma public radio stations have reporters scattered across the state talking to voters. Voters at the North Town Church of Christ in McAlester kept warm in their vehicles as they waited for their polling place to open at 7 a.m. Librarian Heath Stanfield says he votes in every election, but that this one feels more important. 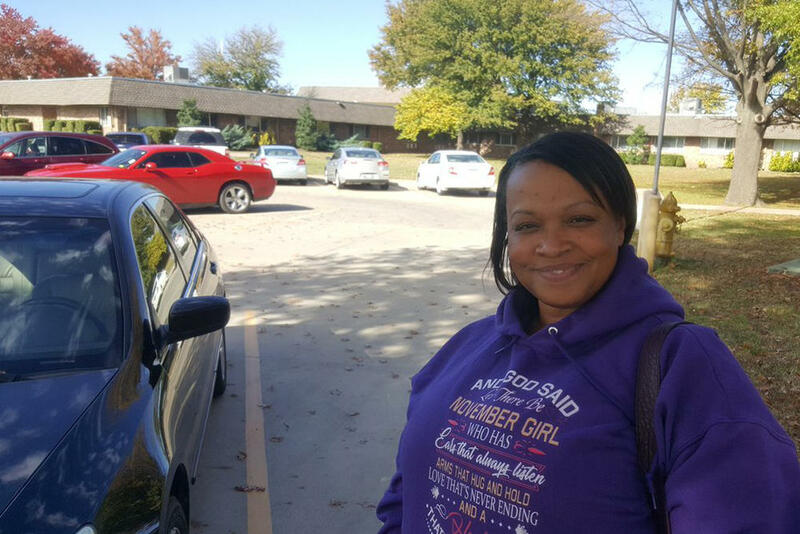 Velva Moore stopped in to vote on her way to the Oklahoma State Penitentiary, where she works. She didn’t vote in 2016, but says her motivation for getting back into the voting booth is simple. 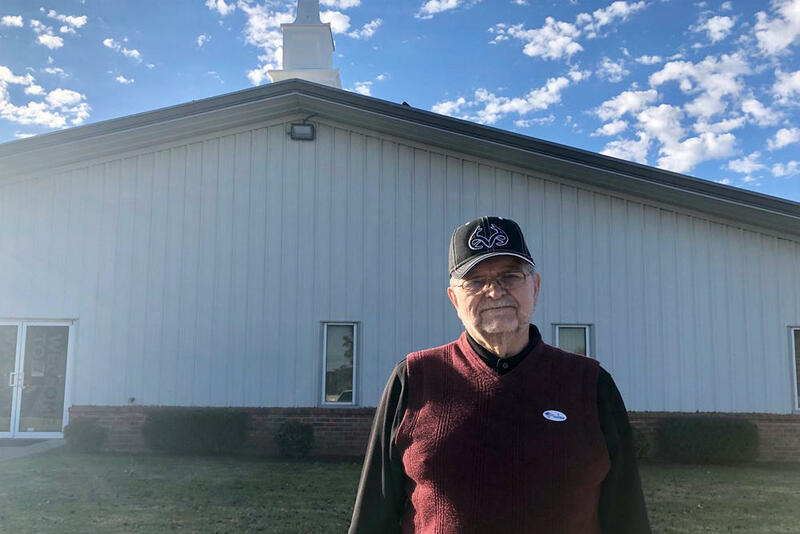 “I wanted to get Democrats in (laughs) so I voted,” Moore said. Attendance was steady at this location for an hour after it opened. 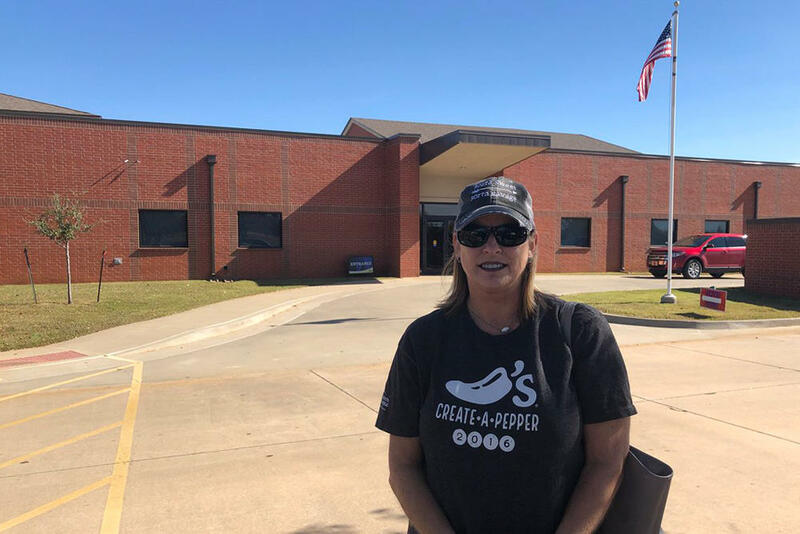 There wasn’t a line out the door, but that sort of thing is rare in a small city like McAlester, where residents only need to find about 10 minutes on Election Day to vote. A line of voters formed at Oakdale Baptist Church in Edmond right as polls opened. Some were voting before work, others for the first time before school. Mom and daughter duo Jada and Taylor Norman say they want Drew Edmondson to be Oklahoma’s next governor. Other voters like real estate investor and developer Jim Tacker says he usually comes right before work. He says the precinct is small enough he only needs 20 minutes to cast a ballot. The parking lot of the World Harvest Church in Stillwater carried a stream of residents placing their vote before work. Ebonie Hill came to this precinct with hopes of improving her children’s education. Paige Lee of Stillwater said voting gives everyone equal power. We’ll be following election news and results throughout the day and into the night on Oklahoma’s public radio stations. Polls are open until 7 p.m. In one of the many statewide offices being decided today, incumbent Republican Attorney General Mike Hunter is facing Democratic challenger Mark Myles. Hunter enters the general election after narrowly winning a Republican primary runoff. Myles didn’t draw a primary opponent. Hunter is a former state Legislator and he was first assistant attorney general under Scott Pruitt. Last year, Governor Mary Fallin appointed him as AG after Pruitt left to run the Environmental Protection Agency in Washington, D.C. Hunter believes his recent job performance will give him an edge with voters. Myles is a private practice attorney who has worked as a prosecutor and defense attorney. He left a long career with tech company IBM to go to law school and he started practicing in 2008. Myles hopes to ride a wave of support for Democrats and win over Republicans who voted against Hunter in the primary. Hunter has received nearly $2 million dollars in campaign contributions, which dwarfs the roughly $79,000 dollars donated to Myles’ campaign. Polls are open until 7pm tonight, as Oklahomans go to the polls to vote for the state’s next governor, legislators, congressional representatives and more. KOSU, KGOU, KCCU & NPR are combining to air live election results coverage beginning at 6:45 p.m. tonight. We’ll have dispatches from public radio reporters across the state and expert analysis from panelists at our watch party. Speaking of our watch party, you can watch live radio being made and mix and mingle with other public radio fans beginning at 6:30 p.m. tonight at OCU School of Law, 800 N. Harvey Avenue in Oklahoma City. It’s free and open to the public! There will be food, drinks and prize drawings for tickets to The Moth in Tulsa on November 15 and to An Evening with David Sedaris in Midwest City on November 14. More information can be found here. It’s been a momentous election season that really kicked off with legislative gridlock and the teacher walkouts this spring, and has since been marked by a tough Republican primary and run-off for governor and the primary ousting of nearly a dozen incumbents from the state legislature. There’s been a big spike in voter registration, and it’s predicted to be one of the strongest mid-term turnouts in decades. View a sample ballot and find your polling place here. Oklahoma Engaged surveyed likely voters in May, and the biggest issue that respondents said was facing the state was Governor May Fallin. In fact, Fallin has the lowest approval rating of any governor in the country at just 17 percent, according to Morning Consult. That dissatisfaction has played a big role in the race for governor. The desire for change is evident, but will it be turning to a Democrat in Drew Edmondson or a political outsider in Kevin Stitt? A likely voter survey conducted by SoonerPoll just last week shows a razor thin margin in the governor’s race. 47 percent of voters in the poll said they supported Kevin Stitt. Edmondson trailed by just three points, which is inside the margin of error. Six percent of voters said they were undecided. We’ll also be following the balance of power in the state legislature tonight. If there are no upsets tonight, 40 percent of the legislature will be new, and an even larger number will have less than two years of experience at the capitol. There are also five ballot initiatives on the ballot today. Get caught up on all of them and see some breakdown videos here. Education is a top issue in today’s election with the two leading gubernatorial candidates promising more funding for schools – and nearly 50 current and former educators still on the ballot. The two leading gubernatorial candidates – Republican Kevin Stitt and Democrat Drew Edmondson — have both made education a central aspect of their campaigns. Stitt says, if elected, he’ll focus on increasing teacher pay in his first year of office. Edmondson, on the other hand, says he will prioritize increasing school funding so districts can hire more teachers, and reduce class sizes. Educators across the state have worked hard so far this election season to oust incumbents they feel were not strong supporters of public schools. 12 incumbents lost in the primaries, and 44 incumbents face opponents today, some of them teachers. Preliminary numbers from Tuesday morning indicate a strong turnout in this midterm election. Early voting and vote by mail numbers from the Oklahoma State Election Board show that, so far, turnout is more than double what it was in 2014, the last gubernatorial election. Over 66,000 Oklahomans have voted by mail, and approximately 107,000 people voted early, making a total of about 173,000 votes cast so far. That’s compared to about 70,000 in 2014. Fifty percent of those who have already cast a ballot are registered Republicans, and about 40 percent are registered Democrats. More than 80 percent are over the age of 45. Oklahoma Engaged is a public service journalism collaboration of KOSU, KGOU, KWGS, KCCU, and StateImpact Oklahoma with support from the Ethics and Excellence in Journalism Foundation, the Kirkpatrick Foundation, and listener contributions. Prev Join Us On Election Night!